A new report by Oil Change International reveals that U.S. taxpayers continue to foot the bill for more than $20 billion in fossil fuel subsidies each year. The analysis outlines tax incentives, credits, low royalty rates, and other government measures benefiting the oil, gas, and coal sectors. While the majority of Americans want stronger U.S. action on climate change, policies at the state and federal level continue to underwrite the ongoing exploration and production of fossil fuels. Every dollar spent subsidizing this industry takes us further away from achieving internationally agreed emissions goals, and maintaining a stable climate. Fossil fuel subsidies have been defended by a Congress influenced by $350 million in campaign contributions and lobbying expenditures by the fossil fuel industry – which equates to a 8,200% return on investment. The cost of annual federal fossil fuel production subsidies is equivalent to the projected 2018 budget cuts from Trump’s proposals to slash 10 public programs and services that benefit some of the nation’s most vulnerable children and families. Government giveaways in the form of permanent tax breaks to the fossil fuel industry – one of which is over a century old – are seven times larger than those to the renewable energy sector. Immediately repeal existing tax breaks for fossil fuel exploration and production, and halt efforts to extend and expand tax credits for unconventional fossil fuel production technologies, like carbon capture and storage and enhanced oil recovery. Champion broader legislation that ends investment in fossil fuel expansion, and funds a just transition for industry-dependent workers and communities, while supporting a clean, renewable energy economy. Break the cycle of dirty energy money, particularly by elected officials at all levels of government pledging to refuse campaign donations and other forms of support from the oil, gas, and coal industries. I do not support further exploration of fossil fuel sources. This isn’t good for Americans or the natural habitats of our country. Fossil fuel usage also negatively affects the atmosphere. The poorest people receive very little of the subsidies provided for gasoline and LPG. As Oxfam reported, the richest 10% of the world’s people contribute 49% of the CO2. That also means the rich use the most carbon based fuels so receive the most benefit. So many in the USA drive as to make this graph’s numbers a tough fit on gasoline alone, but substitute gasoline with “jet fuel and gasoline” and the global situation probably fits similarly. It was Prof Kevin Anderson who suggests the “top 10%” number might be approximated as Academics, Business Leaders, Policy Makers, & Frequent Fliers. The maze of legislation for direct and indirect subsidies is daunting to consider, let alone tabulate. Your report is wise to say “more than” as to what the total amount of subsidies – but the economic tipping point for many of the US fields is a direct result of subsidies. The answer is power-to-gas and fuel cells. If the US government put a fraction of the $270 billion in loans awarded to the shale oil and gas industry (that will never be paid back) into fuel cell and P2G technology, we would already have domestic synthetic fuel production at a much lower cost than todays fossil fuel industry. Of course a lot more renewable energy is needed to provide power for electrolysers; but this is what is going to happen. If we consider the pitiful $3 million awarded to FuelCell Energy for commercialisation of its reversible fuel cell/electrolyser units, we can see why the technology is not generating the revenue of fossil energy technologies. The reality is that methane emissions from fracking will guarantee any profit made in the long-term is lost. $100 billion per year is already spent on outages per year due to climate-related damages to grid infrastructure alone in the US; this will only increase as America becomes more dependent on shale oil and gas. It is a particularly vicious circle; and the only way out is to diversify gas production with the virtually unlimited potential of biomethane (from wastewater, agriculture, municiple waste, food waste, forestry waste etc) and hydrogen from renewables. Fuel cell efficiencies further reduce required energy inputs. I’d like to help eradicate the unneeded oil subsidies from the federal budget. We are stealing the future from our children and grandchildren. 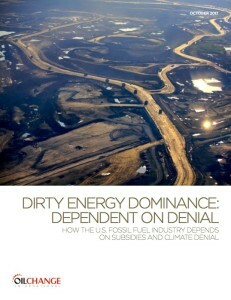 We need to assess fossil fuel subsidies and energy return on energy invested together. With lower EREI, some types of fossil fuels may be already draining resources from other parts of society through government’s subsidies.